The Commonwealth of Dominica, the largest of the Windward Islands, is a lush, green, volcanic island. It is rather poor and undeveloped, much of it covered with rainforest. 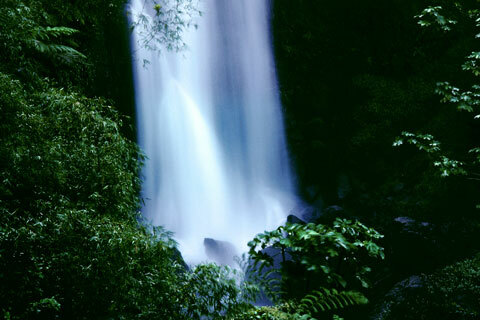 Hot springs, pristine rivers, and tropical terrain make Dominica an ecotourism destination. Dominica, whose capital is Roseau, lies between Guadeloupe and Martinique. It is sparsely populated, and while the official language is English, a large part of the population speaks Creole. The original people of the Eastern Caribbean, the Carib Indians, call Dominica Wai'tukubuli, meaning "Tall is her body." Colonial European powers weren't interested in this rugged island, and many Carib Indians settled in Dominica after being driven out of neighboring islands. After British takeover in 1805, Dominica eventually gained independence in 1978. About 3,000 Carib people live in the 3,700-acre Carib Territory on Dominica today. Following the devastating hurricanes of 2017, the Caribbean is back in the headlines with dramatic new hotel openings including several in Dominica and Cuba. By Jim Dobson, Contributor. Forbes. Friday, 4 Jan 2019 11:09:00 -0500. In Dominica, hot springs, sulphur pits, waterfalls, lush rivers, and black sand take the place of white sand beaches. Activities include riding the Rainforest Aerial Tram, diving, hiking, and visiting the Carib community. Whale watching is popular, and cruise ships stop at the island for duty-free shopping or tours to nature sites. Dominica offers a variety of accommodations. There are natural resorts in the mountains and rainforest, as well as villas near the beaches. Some of the unspoiled areas make romantic backdrops for weddings. Restaurants offer special local foods such as octopus, frog legs, and crayfish, as well as land crab, wild pig, and Callaloo soup. Markets supply tropical fruits, coconuts, and root crops.